As some of you have successfully guessed, HP Inc have been testing the LVFS for a few months now. There are now a few devices by HP available in the stable metadata and there are many more devices planned. If you’ve got a Z2, Z6, Z8, Z440, Z640 or Z840 system then you might want to check for an update in the GNOME Software updates panel or using fwupdmgr update in the terminal. There are quite a few updates with important fixes for various CVEs. I don’t know how many different models of HP hardware they are planning to support, or the order that they will be uploaded but I’m happy with progress. With the addition of HP, the LVFS now has most major OEMs uploading firmware. There are a few exceptions, but even seemingly-unlikely companies like Microsoft are still interested in shipping firmware on the LVFS in the future. If you want to know more about joining the LVFS, please just send me an email. I’ve just merged a plugin developed with the donation of hardware and support of Star Labs. Any ATA-compatible drive (even DVD drives) supporting ATA_OP_DOWNLOAD_MICROCODE should be updatable using this new plugin, but you need to verify the TransferMode (e.g. 0x3, 0x7 or 0xe) before attempting an update to prevent data loss. Rather than calling into hdparm and screenscraping the output, we actually set up the sg_io_hdr_t structure and CDB buffer in the fwupd plugin to ensure it always works reliably without any additional dependencies. We only use two ATA commands and we can share a lot of the infrastructure with other plugins. For nearly all protocols, on nearly all devices, updating firmware is really a very similar affair. 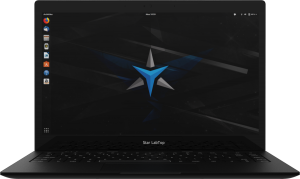 There should soon be firmware on the LVFS that updates the StarDrive in the Star Lite laptop. I opened up the Star Lite today to swap the M.2 SSD to one with an old version and was amazed to find that it’s 80% battery inside; it reminded me of the inside of an iPad. Really impressive engineering considering the performance. If any vendor is interested in deploying updates on the LVFS using the new ata plugin please let me know. Comments welcome. I’ve just deployed two security enhancements to the LVFS. It’s important to note that is is proactive in response to suggestions from OEMs, and there has not been any security issue with the service. All passwords will be upgraded to a modern PBKDF2, in our case using SHA256. By logging in to the LVFS your password is automatically upgraded and no manual action is required. Any user accounts that have not been used by this time next year will be sent an email to remind them. 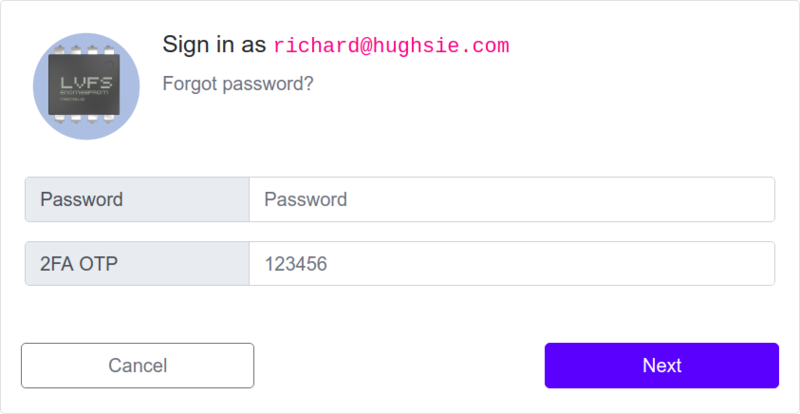 Local users can now optionally secure their accounts using two factor authentication, in our case using OTP. Users can opt-in to 2FA in the usual “Profile” menu once logged in to the LVFS. In the profile section you can also test your OTP PIN before enabling it for your account. Two factor authentication is considered a very good way of securing your user account and is a very good idea for administrator, manager and QA user access levels. Although 2FA isn’t required for all account types at the moment, in the future we might tighten the security policy a little bit when we know it’s all working for everybody. As a consequence of these changes, the login dialog for the LVFS now looks a little different. All the same buttons are there (forgot password etc) but now the login process is a 2-step process rather than a single process. For vendors using OAuth, nothing much changes, and if required 2FA should be enabled by your domain administrator rather than enabled on the LVFS. If anyone has any problems, please let me know. Just like AMI, Phoenix is a huge firmware vendor, providing the firmware for millions of machines. If you’re using a ThinkPad right now, you’re most probably using Phoenix code in your mainboard firmware. Phoenix have been working with Lenovo and their ODMs on LVFS support for a while, fixing all the niggles that was stopping the capsule from working with the loader used by Linux. Phoenix can help customers build deliverables for the LVFS that use UX capsule support to make flashing beautiful, although it’s up to the OEM if that’s used or not. It might seem slightly odd for me to be working with the firmware suppliers, rather than just OEMs, but I’m actually just doing both in parallel. From my point of view, both of the biggest firmware suppliers now understand the LVFS, and provide standards-compliant capsules by default. This should hopefully mean smaller Linux-specific OEMs like Tuxedo and Star Labs might be able to get signed UEFI capsules, rather than just getting a ROM file and an unsigned loader. We’re still waiting for the last remaining huge OEM, but fingers crossed that should be any day now. When fwupd writes firmware to devices, it often writes it, then does a verify pass. This is to read back the firmware to check that it was written correctly. For some devices we can do one better, and read the firmware hash and compare it against a previously cached value, or match it against the version published by the LVFS. This means we can detect some unintentional corruption or malicious firmware running on devices, on the assumption that the bad firmware isn’t just faking the requested checksum. Still, better than nothing. Any processor better than the most basic PIC or Arduino (e.g. even a tiny $5 ARM core) is capable of doing public/private key firmware signing. This would use standard crypto using X.509 keys or GPG to ensure the device only runs signed firmware. This protects against both accidental bitflips and also naughty behaviour, and is unofficial industry recommended practice for firmware updates. Older generations of the Logitech Unifying hardware were unsigned, and this made the MouseJack hack almost trivial to deploy on an unmodified dongle. Newer Unifying hardware requires a firmware image signed by Logitech, which makes deploying unofficial or modified firmware almost impossible. There is a snag with UEFI capsule updates, which is how you probably applied your last “BIOS” firmware update. Although the firmware capsule is signed by the OEM or ODM, we can’t reliably read the SPI EEPROM from userspace. It’s fair to say flashrom does work on some older hardware but it also likes disabling keyboard controllers and making the machine reboot when probing hardware. We can get a hash of the firmware, or rather, a hash derived from the firmware image with other firmware-related things added for good measure. This is helpfully stored in the TPM chip, which most modern laptops have installed. Although the SecureBoot process cares about the higher PCR values to check all manners of userspace, we only care about the index zero of this register, so called PCR0. If you change your firmware, for any reason, the PCR0 will change. There is one PCR0 checksum (or a number slightly higher than one, for reasons) on all hardware of a given SKU. If you somehow turn the requirement for the hardware signing key off on your machine (e.g. a newly found security issue), or your firmware is flashed using another method than UpdateCapsule (e.g. DediProg) then you can basically flash anything. This would be unlikely, but really bad. If we include the PCR0 in the vendor-supplied firmware.metainfo.xml file, or set it in the admin console of the LVFS then we can verify that the firmware we’re running right now is the firmware the ODM or OEM uploaded. This means you can have firmware 100% verified, where you’re sure that the firmware version that was uploaded by the vendor is running on your machine right now. This is good. As an incentive for vendors to support signing there are now “green ticks” and “red crosses” icons for each firmware on the LVFS. All green ticks mean the firmware was uploaded to the LVFS by the OEM or authorized ODM on behalf of the OEM, the firmware is signed using strong encryption, and we can do secure attestation for verification. Obviously some protocols can’t do everything properly (e.g. ColorHug, even symmetric crypto isn’t good) but that’s okay. It’s still more secure than flashing a random binary from an FTP site, which is what most people were doing before. Not upstream yet, and not quite finished, so comments welcome. A few days ago I cut the 0.1.4 release of libxmlb, which is significant because it includes the last three features I needed in gnome-software to achieve the same search results as appstream-glib. The indexing being denoted by $'' rather than the normal pair of single quotes. If there is something more standard to denote this kind of thing, please let me know and I’ll switch to that instead. The third feature is: Stemming; which means you can search for “gaming mouse” and still get results that mention games, game and Gaming. This is also how you can search for words like Kongreßstraße which matches kongressstrasse. In an ideal world stemming would be computationally free, but if we are comparing millions of records each call to libstemmer sure adds up. Adding the stem() XPath operator took a few minutes, but making it usable took up a whole weekend. The query we wanted to run would be of the form id[text()~=stem('?') but the stem() would be called millions of times on the very same string for each comparison. To fix this, and to make other XPath operators faster I implemented an opcode rewriting optimisation pass to the XbMachine parser. This means if you call lower-case(text())==lower-case('GIMP.DESKTOP') we only call the UTF-8 strlower function N+1 times, rather than 2N times. For lower-case() the performance increase is slight, but for stem it actually makes the feature usable in gnome-software. The opcode rewriting optimisation pass is kinda dumb in how it works (“lets try all combinations!”), but works with all of the registered methods, and makes all existing queries faster for almost free. One common question I’ve had is if libxmlb is supposed to obsolete appstream-glib, and the answer is “it depends”. If you’re creating or building AppStream metadata, or performing any AppStream-specific validation then stick to the appstream-glib or appstream-builder libraries. If you just want to read AppStream metadata you can use either, but if you can stomach a binary blob of rewritten metadata stored somewhere, libxmlb is going to be a couple of orders of magnitude faster and use a ton less memory. If you’re thinking of using libxmlb in your project send me an email and I’m happy to add more documentation where required. At the moment libxmlb does everything I need for fwupd and gnome-software and so apart from bugfixes I think it’s basically “done”, which should make my manager somewhat happier. Comments welcome. The LVFS is slowly and carefully moving to the Linux Foundation, so expect more outreach and announcements soon.